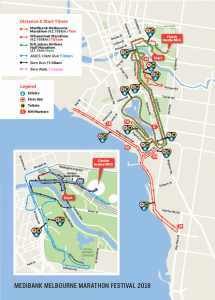 Race through the streets of Melbourne, passing by numerous iconic landmarks such as Flinders Street Station, the Shrine of Remembrance and the Royal Botanic Gardens. 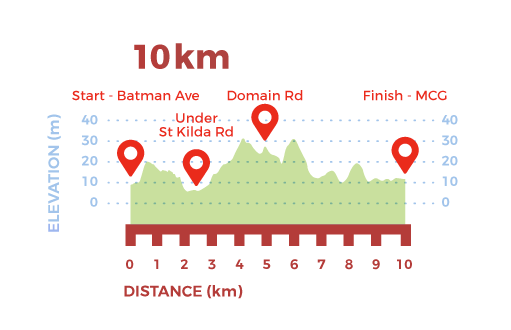 This race is perfect if you’re looking for a challenge, whether it’s setting a new PB or completing your first 10km run. Please note entry fees are subject to change at any time, so sign up early to secure the best pricing. *Please note Competitor Gifts can only be collected from the Gift Collection Tent located at the MCG during Race Week Office opening hours. You must bring your bib with you in order to collect your gift. Head north along Batman Avenue; left into Flinders Street, left into Swanston Street and cross to northbound (west side) service lane at Princes Bridge. Turn right into Southbank Blvd, followed by a right hand turn into Sturt St and proceed (under the St Kilda Rd) along Alexandra Ave to a right hand turn into Linlithgow Ave. Proceed along Linlithgow Ave to Birdwood Ave to right hand turn into Domain Road. Take a right hand turn up Dallas Brooks drive, left onto Birdwood ave, veer left onto Government House drive and then right onto St Kilda Road. 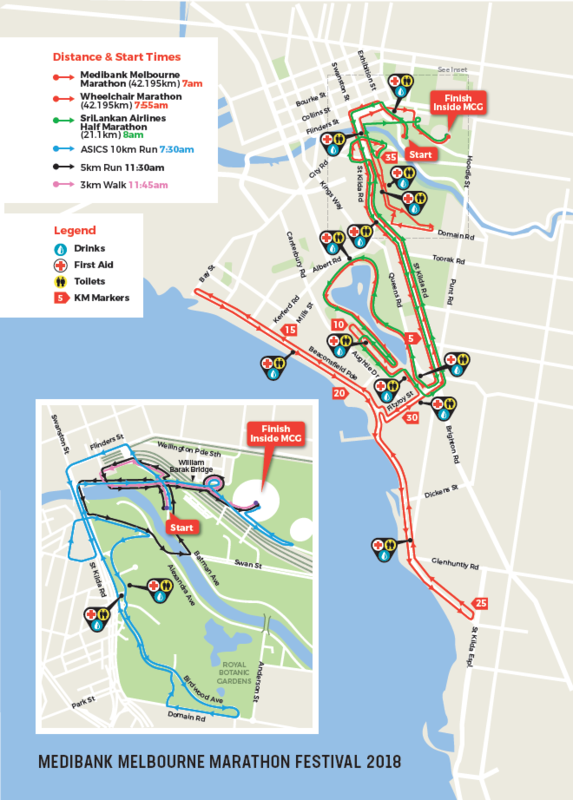 Proceed along St Kilda Road to a right hand turn at Princes Walk (just prior to) Fed Square where competitors will then be running along the paths of Birrarung Marr before veering right onto the William Barak Bridge with a hairpin left hand turn on to Jolimont St.
Continue along Brunton Ave, past Gate C towards Punt rd, then take a U-turn back towards the MCG with a right turn into Gate C and do one lap of the MCG to the finish line. If you wish to WALK, please enter the 3km Walk event. If you do choose to walk in, please keep an eye out for runners as you get close to the MCG and do not block their path. Once you have successfully registered for the event, you can apply for a Preferred Start, which is a starting position immediately behind the Elite field. Applications for Preferred Starts must be made online and should include details of the races (i.e. race name, date and distance) at which qualifying performances have been achieved. Incomplete applications will not be considered. Any participants who are not registered will not be considered. All applications are checked to guarantee times submitted are valid. Applications for preferred starts will open later in the year. Successful applicants will receive an approval email just prior to the event with further details. Please note: applying for a Preferred Start is a separate process to the online race entry system. Applying for a Preferred Start does not guarantee race entry, so please be aware of the race entry cut off times and field limits. Successful applicants will be sent a colour coded Preferred Start sticker and start instructions in the mail closer to the event. The sticker must be attached to your race bib to gain access to the Preferred Start zone. The Preferred Start zone for each race will be located immediately behind the Elite Start, with Preferred Starters only able to access the zone via the entry area provided. An athlete’s assistant package is available on application for runners who have a performance since the 1st January 2019 that is better than our course record. Please note: International athletes will be subject to Withholding Tax, however may be able to claim back if agreements exist between Australia and their country of residence.